During the latest Nindies Showcase it was revealed that Blaster Master Zero 2 – the sequel to the much-liked original – will land on the Switch eShop today for just $9.99. The first game was a Switch launch title, but it seems that this follow-up is both bigger and better, with the protagonist Jason blasting off into space with his buggy chum. With exciting new weapons and boss battles, this looks like a winner. Check out the trailer above and let us know if you plan to pick this up today with a comment below. We'll be reviewing it in the not-too-distant future! Blaster Master Zero was one of the best early Switch games for me, definitely excited to give this one a try once I'm done with Turok. Hopefully the soundtrack on this one will be as great as the first one. DAY 1, THIS DAY, TODAY. IMMEDIATE PURCHASE. You can download it now! If it doesn't show up on the eShop wait for the "News" post for it and it'll take you to the game's eShop page. I’ll get it tomorrow on payday. First game was dope. Brilliant. Really, really liked the first one. Love that it's keeping the still-frame comic-book style story sequences, too. @PBandSmelly So, I would recommend getting the first Blaster Master Zero as well. The game takes story elements from the original Japanese version, the Westernized NES version, and a novel released back in the day. I am tempted to buy this today, but man my backlog is so long. Whoooooa what a heavy shadow drop! Didn't tune into the direct ...but wound have flipped over this! I wish I had money to get it, I just spent all my left over funds on PC spring sales. Damn you fanatical and humble bundle! Never got round to Blaster Master 0 so this one is out of the question for now, but the demo of the first is pretty good so in the unlikely event that I have some spare time I may dig in to the first one and then on to this one. Wasn’t expecting that. My early Switch game was the first game. Getting the sequel is a no brainer. Already purchased the game on nintendo.com and I'm not even home yet to play it! Probably the best $10 ever. The first one was solid fun. @NintendoFan4Lyf That's my deal too lol, I have the first one and have gotten about halfway through it. With my completely insane backlog, and the fact that I'm now gonna be hooked on Nuclear Throne for the next month or so, I just don't think I need to get this one yet lol. First world problems. Definitely going to pick this one up sometime soon. The first one was pretty great so this is a no brainer. I thoroughly enjoyed Zero, so this is a definite for me. I'm working on a couple other games currently, so will pick this up when I can play it. Best announcement today! Loved to play through the first one with every DLC character!! Inti Creates just rocks!! Original was such a surprising gem of a game. First game I beat on Switch. Will probably download this immediately after work. This is pretty good I am going to get this when I get home. Solid first eshop purchase, for me. Too many titles in the backlog for a day-1, will buy it someday. @PBandSmelly Blaster Master Zero is an incredible game, I’d definitely recommend getting it in addition to the sequel. This game just went straight to the top of my backlog which is a testament to how much I like the first one, Blaster Master in general, and Inti Creates. I'm trying to fight the urge at the moment to get it because I can get it literally right now... Curse you backlog for existing! Yup, I already bought it. I’ll play it sometime soon. Will this help me master the spin? Instabuy. Felt in love with the original when it came out 2 years ago. @PBandSmelly No, since it’s all manmade. Only natural objects have the essence of the Golden Rectangle. Nice try though. My backlog got DESTROYED today with all the sales... I downloaded 5 games on top of this one. This might move up to the top of the list after finishing Flipping Death (hopefully) this week as I imagine it's not super long and the first one was one of my hidden gems from two years ago. I can hardly believe it's only ten bucks. I bought the original for the same price two years ago, and I can still hardly believe IT cost ten bucks, too. I am playing the game right now. That mountain is not easy and... (better dont spoil). This game will let good memories from the bosses like the first one. Anyone manage to beat it yet? Enjoyed the previous game but it was really too short. Wow, there are some brilliant new game mechanics in here and applying those mechanics to a platforming vehicle is kind of unique and original in its own right. This is how you do a proper NewWave retro game! 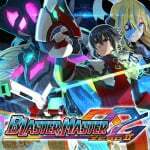 @PBandSmelly Buy Blaster Master Zero before this one. @Medic_alert If you're so short on time, why are you wasting it making random posts on Nintendo Life and reading articles about games you don't intend to play?! I adored the first game and as luck would have it I finished a replay of it just last week! So as soon as I saw this I was straight onto the eShop to buy it. Now if we could just get physical releases, the first game definitely deserves it. I wonder if we’ll get a Mighty Gunvolt Burst sequel too now? @Deltath because this is easy to do in moments of doing things. I can comment on my commute for instance. I also enjoy conversations about the hobby I love. Why does the gaming community always have to be such a nit-picky bunch of p***ks? If this is how I want to spend my time then it has nothing to do with you and there is no need to try and score points off me. As I said, I think it looks decent and if there is time I may play it. I loved the game though, as am definitely gonna get the sequel, I just wish I didn't have to split up a series on multiple systems, but oh well...it's happened before. I’m a fan, and Zero has many great aspects and moments, but it needed more playtesting and refinement. I just finished it after seeing the announcement of 02 and it was very apparent coming back to it after a long break. There is one weapon that defeats most boss battles way, way too easily, for instance. Also, the top down stages varied from kinda boring strolls to cheap to why is this cave even here because there is nothing of value in it. There was effort put into getting you to use more weapons in the second half and many clever parts. All the framework for a great game is there, and I still really like the game but they seem to have rushed it to the launch — probably the right business move. So far, jumping right into 02 it is night and day difference. First stage is tightly designed teaching you something every screen keeping the play dynamic and interesting and the best part is that the top-down stages are vastly improved and fun to play. Super happy that they took there time with this and really looking forward to playing more! @Medic_alert Hey, I was just curious. You're the one who brought up how little time you had. I honestly don't even know what you're talking about, scoring points off of you. If you really enjoy conversations about your hobby so much, maybe you shouldn't be so hostile when someone asks you a simple, harmless question. If you didn't want to answer, you could have ignored the question or politely declined instead of lashing out, insulting me and the entirety of the gaming community. From my vantage point, you were the only problem in the community in this particular exchange. @Mach_Rider It's not like it has some save data transfer system. I don't really see any downside on you not having it on Switch. And if you really need both, it's only $10 and goes on sale occasionally for half that. @aaronsullivan I don't think the first one felt rushed at all. I just think some of their design choices, particularly the weapon increase system, was a philosophy that they probably liked in development and didn't realize it would be so easy for players in the long run. Some of those things you're not going to know how players feel until it's out in the wild and thousands or millions of players have had a chance to take a go at it. Also, they added so many new modes and ways to play it that mostly altered that balance any way. @Deltath well if that's was your intention you failed in your wording. You questioned how I use my time and made it sound as though I had no business commenting. Even though I didn't finish BMZero yet, I'm going to jump right on this. @Medic_alert I asked how you use your time and I in no way indicated you had no business commenting. I literally asked you a question. If you inferred an unspoken meaning from text on the internet, that's on you. The implication wasn't there. It doesn't even make sense that anyone would mean that. How or why would anyone try to claim that you have no business commenting? What you do with your time is up to you. But if you have so little of it, I was curious why you'd spend it here with the rude people that troll the comments section. And you've spent plenty more being hostile. And after I even politely explained myself, which didn't need doing in the first place, you just doubled down and tried to make it my fault that you chose to be hostile. @Deltath look if you meant no ill then fine. I can't tell you what you meant. All I can say is your wording comes across as a challenge. 'wasting' my time certainly has a negative connotation and this is not how you ask a polite question. @Medic_alert I hear you. It's hard to know how people intend what they say online and most people like to come out swinging, so I get it. This game is way, way better than the first one and has some fine-tuned level design. I don’t know how Inti always manages to deliver, they have such a flawless lineup on eShop. @NintendoFan4Lyf You know earlier in the year after I bought Smash Ultimate I thought I wasn't going to buy any other games (they would just end up piling over my 100+ backlog). How wrong I was as soon as the first game for the Nindies Showcase was revealed. @GyroZeppeli Gonna be shooting all of the Mutants Today! there's gonna be a lot of Saint Corpses on the ground! @PBandSmelly No, but you need to play through the first game (Blaster Master Zero) if you want to master and unlock the secrets of the arrow, after-all this game is a REQUIEM of its former self! An it wouldn't let you go back to correct everything if you were already at the Final Area! @Reigestugatensho Oh I have to maintain a lot of discipline. In my household, we setup a monthly "fun-money" budget, which happens to be enough for me to buy one brand-new game every single month. If we don't use our money, it rolls over to the next month. Sounds great, right? Well, I got a crap load of games for Christmas for Switch, Xbox One, and PS4 that I just can't seem to put a dent in due to time (and Kingdom Hearts 3 putting everything to a grinding halt until I finish it). Needless to say, my money has rolled over a couple of months because I can't think of anything else to spend the money on except games! I don't really have the time to watch movies, so buying them is pointless. First-world problem, but I just can't justify buying more games until I finish the one's I have! I think I may burn the money on Resident Evil 2, Sekiro, and Yoshi. That will still leave me with $20 to put in my eShop account for a rainy day. @Reigestugatensho I always find the Yoshi games to be rather charming - even if they are relatively simple. Sometimes, I just prefer the simple things in life. Gaming zen. @NintendoFan4Lyf I enjoy Yoshi as well! too bad I'm playing things like Enter the Gungeon and Cuphead (absolutely Zero Zen)! @Reigestugatensho Yeah, I am bouncing between Mega Man 11 and Hollow Knight on the Switch at the moment. @NintendoFan4Lyf well, I saw that FUZE4 Nintendo Switch got pushed back to May 31st so my rage levels are pretty high.